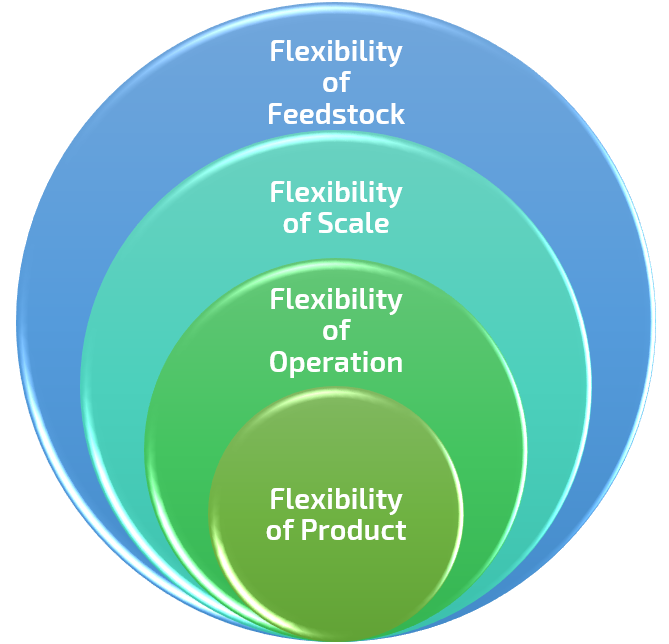 The flexJET process is highly scalable and less capital-intensive than current technologies and can be integrated into the existing aviation fuel infrastructure. It produces a sustainable, cost-competitive aviation fuel by combining regional and local supply and demand strategies in a circular economy. As a key factor to the decarbonisation of the aviation transport sector, it contributes to the Renewable Energy Directive Targets in Europe and to the fulfilment of the Carbon Offsetting and Reduction Scheme for International Aviation (CORSIA) goals. flexJET demonstration plant for 12 t/day food & market waste and 4000 l/day of Used Cooking Oil (UCO) in Baden-Wuerttemberg, German. Demonstrate co-refining of used cooking oil and TCR® oil to Sustainable Aviation Fuel (SAF) and other fuel quality hydrocarbons. Produce hydrogen for refining through separation from syngas based on Pressure Swing Adsorption technology. Deliver 1200 tons of SAF (ASTM D7566 Annex 2) for commercial flights to British Airways. Benchmark TCR® jet fuel for ASTM certification – focus on generic annex.